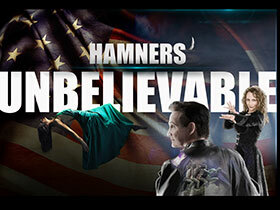 At “Hamners’ Unbelievable Variety” Branson show, you’ll be treated to a sensational array of Branson entertainment! Led by master magicians, Dave and Denise Hamner, the show is packed full of performing artists; the variety includes sensational singing, phenomenal dancing, stunning illusions, and a singing impressionist too spot-on to be believed! The Hamner’s deliver magic that’s at once awe-inspiring, dazzling, and touching. Their talent has been recognized by the magic industry with the Magical Masters Award from their peers in Las Vegas, Siegfried & Roy, who presented them with the Bronze Lion Head Award; they also appeared on NBC’s World’s Greatest Magic. The birds in their act are an audience favorite; it’s an astonishing sight to see gorgeous cockatoos and macaws appear out of nowhere and fly over and around the audience. Their original feats of magic have been seen in Las Vegas and Disneyland, but it’s Branson they love best! Hamners’ Unbelievable Variety Show has added Johnny Lonestar. He will be doing his Rope-twirling, Gun-spinning, Whip-cracking acts in the show. Johnny will also be being doing a pre show starting at 7:45pm, He amazes audiences with precise trick roping techniques, lightning fast gunslinging ability, and his magnetic personality with some audience participation. Come early and enjoy the pre show starting at 7:45pm. For show times and ticketing information, check out Hamner Variety Theatre!